Now, I'm not really that big on mascara. I always tend to go for something fairly cheap and cheerful when purchasing mascara, as I'm an avid falsies wearer and so only really use it for a quick slither over my falsies to blend them in, and on my lower lashes. With summer approaching however, I've been having odd days where I give my eyes a rest from my trusty false lashes and just whip some mascara on instead. Because I'm not particularly a fan of the natural-look, when looking for a mascara I want something with lots of volume and length. When I saw this Maybelline mascara on offer in my local Boots, I thought it was worth giving a whirl. I'll admit it, I kind of gave in to the marketing around this product, but I'm glad I did. It's a really good mascara - it definitely gives lots of volume and length, and for someone who is never seen without fake lashes I don't feel TOO naked wearing it. I do find it clumps if you get a bit too application-happy with it, but other than that I really love it. I'm not sure it quite beats my fave in the best mascara-stakes (my favourite is Blink+Go Long-Lasting Mascara) but it makes a pretty close second. I took pictures (see above) of me wearing no mascara (eep!) and me with it on, purely because you always see me with false lashes on so I thought it was only fair on the mascara to show you what I look like without them - scary I know! 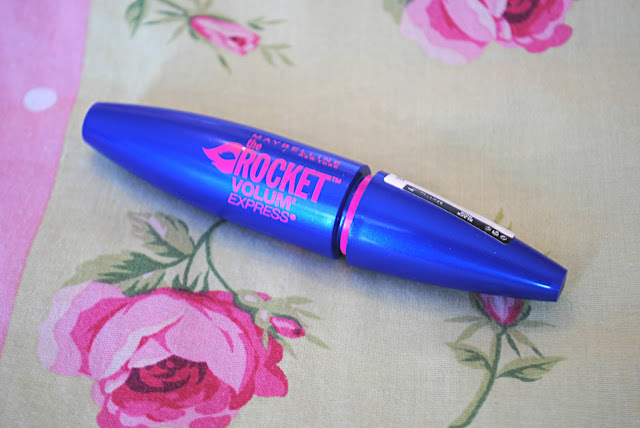 Have you tried Maybelline's Rocket Volum' Express Mascara? What did you think?